If leather is to retain its beauty, it must be cared for, cleaned and conditioned. It’s much easier to spend a little time protecting and conditioning your fine leather upholstery than spending the energy and money to salvage it. Keeping your leather in good condition begins with a regular wipe down with your favorite one-step cleaner. 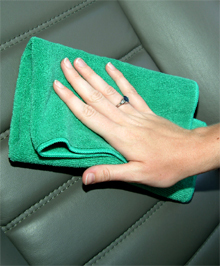 Our daily “one-step” starts with Pinnacle Leather Cleaner/Conditioner on a Cobra Microfiber Towel. Have you seen leather that has been ignored and mistreated? What remains is dried, prematurely aged, and cracked leather. Without proper care and conditioning your leather will age rapidly, losing its luster and flexibility. This process is rapidly accelerated in warmer climates. Regular cleaning and conditioning is all it takes to keep leather looking fresh, supple, and soft. What Is Proper Leather Care? Pinnacle Leather and Vinyl Cleaner, a pure cleaner, free of petroleum solvents, silicone oils or gloss agents, penetrates deep into every pore. 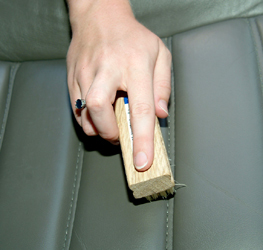 It should be applied with a Cobra Microfiber Applicator Pad, or a Leather and Vinyl Scrub Brush. Agitation, not scrubbing, is the key. This agitation opens pores and allows dirt and body oils to rise to the surface of the leather where it can be wiped away. After a thorough cleansing, your leather is ready for step two: application of a quality conditioner, like market leaders, Wolfgang Leather Care Conditioner or Pinnacle Leather Conditioner. These conditioners are calibrated to nourish and moisturize. They are engineered at a molecular level, to absorb deep into the fibers' cells, allowing these fibers to retain their resilience, and thereby inhibit premature aging. Proper conditioning allows fibers to retain flexibility and softness. WARNING! Often inexpensive brands of leather conditioners contain gloss agents and petroleum distillates, silicone or silicone oils, which cling to the surface and then are wiped onto clothing. They leave a greasy finish that can transfer to clothing. For the health of your leather, choose a water-based, pH-balanced leather conditioner. 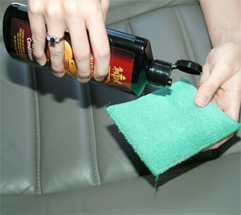 Many popular conditioners, like Lexol Spray Leather Conditioner and the product recommended especially for the Bentley, Jaguar and Rolls lines, Connolly Hide Care Conditioner, are pH balanced, have stain repellants, and waterproofing agents to protect your beautiful interior from accidents. The Wolfgang Leather Care Cockpit Kit contains all the tools you’ll need, AND Wolfgang's leather products are pH balanced. If you only want the best for both leather and vinyl, there is simply no better comprehensive choice for ”state of the art” cleaners, conditioners and applicators than our specially packaged, Pinnacle Concours Interior Kit. With a little time and the right chemicals, your vehicle's leather will remain soft, supple, and inviting for years to come!